With World Penguin Day just around the corner on Saturday 25 April 2015, Polar experts Aurora Expeditions join the world-wide celebrations of the emblematic flightless birds. For more than 20 years, Aurora Expeditions have taken keen adventurers on their ultimate voyages to the Antarctic region, a great opportunity to witness some of the planet’s 17 penguin species. Read on to learn about these adorable creatures and join the celebrations! Social skills - Penguins are very social and live in huge colonies. 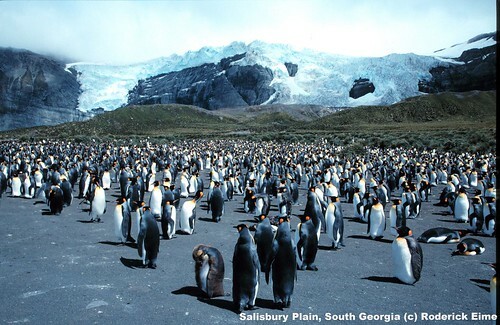 The island of South Georgia is home to one of the world’s largest king penguin colonies with almost half a million birds. An unforgettable mix of sights, sounds and smells! So French, so chic - Named after the wife of French explorer Dumont d’Urville who discovered them in 1840, Adélie penguins are highly dependent on sea ice for its krill and fish-rich ecosystem and are often found on the edge of shelf-ice during sea kayaking excursions! Change of costume - Feathers account for about 80% of penguins’ insulative properties. Penguin chicks are born with brown, grey or white down and start fledging at about seven weeks, preparing to leave the colony. Gentoo chicks are the last ones to leave the nest, only fledging after 14 weeks. Parents of the year - Having extremely well-developed listening skills, adults manage to find their young amongst a crowd of up to 80,000! Some penguin species’ young like chinstrap penguins are organised in groups, or crèches, guarded by just a few adults whilst most of other adults spend their time at sea fishing. The fashionable - One of the most funny-looking penguins with their orange feather plumes above each eye, the Macaroni penguins are found on the Antarctic Peninsula and some islands such as the Falkland Islands/Malvinas and South Georgia. They are named after 18th century flamboyant dressers, the ‘Macaroni Dandies’! Happy feet! Penguins generally have very strong feet with large and well developed claws, allowing them to climb and hop on slippery rocks and icy surfaces. Macaroni’s yellow-crested first cousins rockhopper penguins are well-known for their particular habitat, nesting on rocky slopes, in small caves and crevices. Home sweet home – Most Antarctic penguins species lay their eggs in open nests built with mainly pebbles, but also bones and feathers. Pebbles are highly sought after during nest-building periods, being continually stolen and swapped around between adult penguins, a very entertaining sight for observers. Other species like the Magellanic penguin prefer to dig burrows to breed, and as for king and emperor penguins, no nest needed: males incubate a single egg by balancing it on top of their feet and covering it with a special brood pouch. Always accompanied by a team of expert naturalists, Aurora Expeditions’ passengers delight themselves in spotting and observing the various penguin species, whether they land on South Georgia’s secluded beaches, enjoy their first camping experience on ice or Zodiac cruise through Antarctica’s maze of majestic icebergs and kayak along secret bays. Join Aurora Expeditions on board 54-passenger ship Polar Pioneer during their 2015-16 Antarctic season and witness some of the world’s most fascinating penguin species along with other unique Antarctic wildlife such as seals, whales and diverse birdlife. Voyages depart from November 2015 until March 2016 and offer various itineraries including the Antarctic Peninsula, South Georgia and the Falkland Islands/Malvinas. Prices start from US$8,310 per person in a triple share cabin on 11-day ‘Spirit of Antarctica’ Fly/Sail voyage. All voyages include accommodation and all meals onboard, shore excursions and onboard lectures, talks and workshops and various activities such as kayaking, polar snorkelling or camping (surcharge applies). Cousins from around the globe: Always adding more exploration to their program, Aurora Expeditions’ newer voyages offer travellers a chance to tick two other penguin species off their list! Meet the African penguin in South Africa’s Cape Peninsula on Aurora Expeditions’ 15-day ‘African Cruise Safari’, or learn about the Galapagos Islands endemic penguin on the 24-day ‘Ecuador In Depth’ expedition. For more information please contact Aurora Expeditions on 1800 637 688, at info@auroraexpeditions.com.au or visit www.auroraexpeditions.com.au .